I have a hard time doing the same workout over and over again...and when I get bored, it's time to up my game. Plus, it's really important to increase intensity and vary movements in order to reach your fitness goals and not plateau. Don't get bored with your workouts; check out the three new things I've added to my workouts in the past 2 weeks to "up my game." 1. 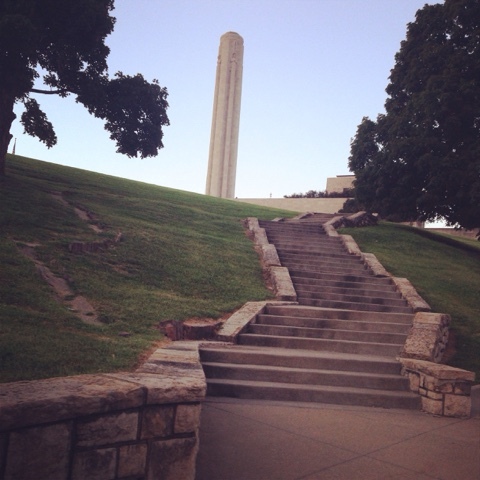 See that pretty picture of the fun looking stairs at Liberty Memorial (KCMO)? That is my new favorite warm up/interval sprinting places. Those stairs...whew! Game UPed! 2. Check out the four year old (who looks like a 10 year old) in my jogging stroller below. 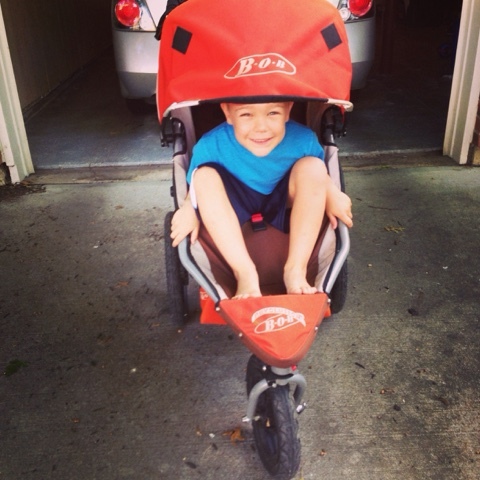 My Sunday morning runs have increased in intensity by about 70lbs (when adding super cute son Carter and the stroller). The smaller 6 month old would be a great choice too...but this kid loves the wind in his hair and yelling "faster" to his super sweaty, panting mommy (that's me, folks) Game UPed! 3. Sometimes my husband and I like to think about what exercises could be combined into MEGA-exercises. For example, last week, we "invented" the Burpee Climber. You do a burpee (with a push up) but before you jump up, you get to do 4 mountain climbers. Game UPed!